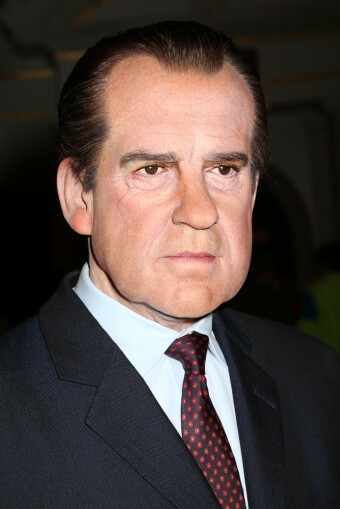 Developed from game theory and a key tactic of his early administration, President Richard Nixon came into office with a clear plan – scare the hell out of other world leaders to get them to do what he wanted. Called the “madman theory,” it depended on possessing a massive nuclear arsenal, then simply acting sufficiently erratic and unbalanced to convince people that you were crazy enough to use it. During the 1968 Presidential campaign, Nixon promised to end the war in Vietnam and obtain “peace with honor,” yet nearly one year into his first term, he was having little success. Peace talks between the North Vietnamese (supported by the Soviet Union) and the South (supported by the United States) had devolved into little more than sitting at a table, with the North Vietnamese saying they could wait “until the chairs rot.” Frustrated, Nixon decided it was time to use his secret weapon – his own reputation as a violent and unhinged, rabid anti-communist who wasn’t afraid to drop a nuclear bomb or two. I call it the Madman Theory Bob. I want the North Vietnamese to believe I’ve reached the point where I might do anything to stop the war. We’ll just slip the word that, “for God’s sake, you know Nixon is obsessed about communism. We can’t restrain him when he’s angry – and he has this hand on the nuclear button” and Ho Chi Minh himself will be in Paris in two days begging for peace. A common example from game theory demonstrates how this works: Two people, chained together, are placed at the edge of a cliff. As soon as one says “uncle,” both will be released, but the other, the guy who held out the longest, wins a big prize. One implementing the “madman theory” would try to bluff his opponent into thinking he just may jump off of the cliff by inching closer, dancing and walking near it, and talking crazy. If he is sufficiently convincing, the other will yield. Believing they had achieved their goals, on October 30, 1969, Nixon recalled the bombers and ended Giant Lance. He and Kissinger were convinced that this sudden reversal of tactics only reinforced his “madman” image in the eyes of the Kremlin, and enabled the arms deal that followed on its heels. Just a little over two weeks later, on November 17, 1969, formal talks for limiting nuclear weapons began in Helsinki, Finland, and 2.5 years later, on May 26, 1972, Nixon and Brezhnev signed an interim Strategic Arms Limitation Treaty (SALT) and the Anti-Ballistic Missile (ABM) Treaty. Nixon, himself, visited from February 21-28, 1972, and was warmly received by the Chinese. At the end of his trip, Nixon described it as “the week that changed the world,” and history seems to agree. Breaking the hard ice formally between the two countries, thereafter they engaged in coordinated efforts to check the power of the Soviet Union throughout the remainder of the Cold War. Sagan and Suri at 171.